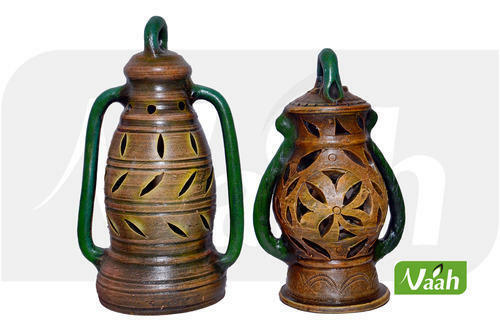 We are among the prominent manufacturers and exporters of optimum quality Terracotta Lantern. The terracotta bells & lantern offered by us are manufactured in adherence to the latest market trends by using advanced machinery. Owing to their eye-catching appearance, sturdy construction and contemporary design, these products are highly demanded in the market. Known for manufacturing and exporting a wide range of optimum quality Handicraft Products, Vaibhavi Aromatics and Handicrafts (A Unit Of Vin Corporation) was set up 2007 at New Delhi. The product range offered by us is inclusive of Aromatics, Wooden Incense Burners and Wooden Handcrafted Furniture items. These products are manufactured from high quality materials that are sourced from trusted and reliable vendors of the industry. By using advanced machinery, our professionals manufacture these products as per the international quality standards. Offered products are highly appreciated for their rich attributes such as perfect finish, elegant design and appealing appearance. These products can be customized as per the specifications provided by the customers. Available with us at industry leading prices, these products are highly appreciated among our customers. Since the inception of our company, we have been backed by our team of skilled professionals and a state-of-the-art infrastructure. Our ability to meet the bulk orders within the assured time frame has helped us in attaining huge customers. We are exporting our products across the globe.